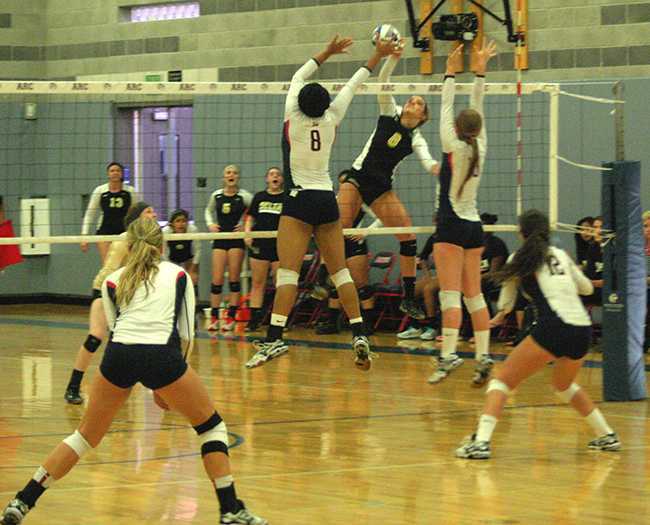 American River College’s volleyball team’s season ended last week at Feather River College in the NorCal Regional semi-final, in which ARC fell by scores of 25-20, 26-24, 25-16 for a 3-0 loss. ARC was tied with FRC in the second game at 24, but FRC managed the final two points to win the game and proceeded take the match in game 3. “It was frustrating and set a tone from the beginning,” she said. Sophomore star player and outside hitter Taylor Bunger thought the team started well, but also noted that unforced errors were the team’s downfall. “We started really well, but then we had some unforced errors. And it kind of went downhill from there,” said Bunger. The team finished the season with an overall record of 22-7, ranking third in the state, and dominated conference play with a 13-1 record. Five players, Kiana Chaney, Courtney Macklin, Erika Jones, Erianna Williams, and Taylor Bunger were named all-conference for the season. There are only 12 all-conference players named in total, and the Big Eight conference includes seven other teams in addition to ARC. Bunger was also named all-state for Northern California. “This team was different because we had a lot of high quality individuals on and off the court. That’s why it was special,” said Frame of her team. Bunger added that the team’s focus was unified and singular throughout the season. “(We just felt like) control the games we can control and just take it one game at a time,” Bunger said. “We set a goal to be undefeated on our home court, and we did that,” she said. Three players, Jones, Macklin, and Johnson, all have signed letters of intent to play at four year schools next season. Frame expects at least a few more players to receive and sign offers by spring. Speaking of the whole team, Frame said, “(This is) the best group of student athletes I think I’ve had. They’re really determined and focused on playing at the next level. Bunger, who has yet to sign, is talking to schools ranging from Humboldt State to one in Massachusetts, and spoke to both the team’s play and ARC’s volleyball program. “The past couple years, we’ve just been getting better and better and better,” she said. Bunger also talked extensively about Frame and how she’s helped the players become who they are. “She’s the best coach I’ve ever had in my entire volleyball career,” Bunger said. Frame, who’s been the head coach since 2009, expects a similarly competitive team despite some of her best of this season moving on. Be the first to comment on "Volleyball team keeps head held high despite ending its season with a loss"